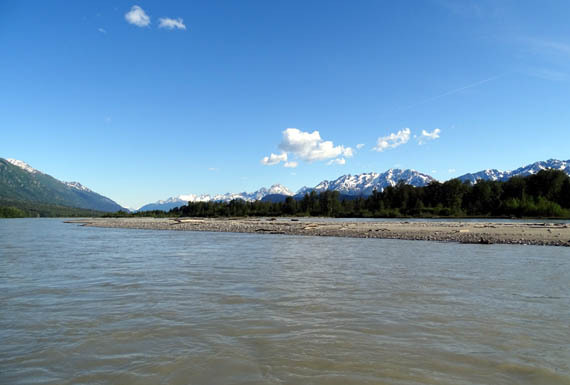 the Chilkat River, where shallow channels make easy targets of spawning salmon." 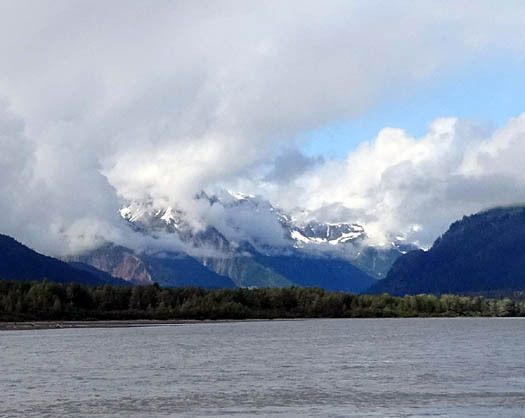 We first saw the wide, braided Chilkat River on Tuesday as we drove along the Haines Highway on our way to the town of Haines. 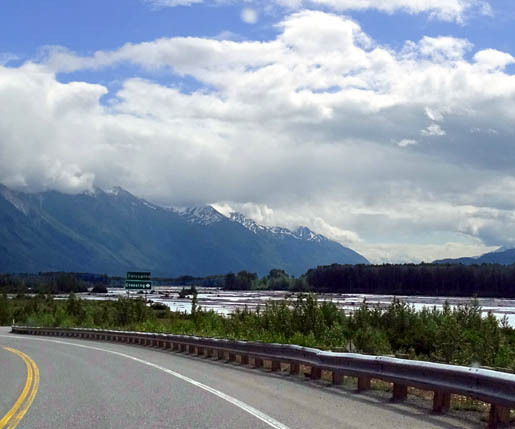 After the dramatic descent from Chilkat Pass the road flattens out for 30+ miles as it closely follows the Klehini and Chilkat Rivers downstream to Haines and the Chilkat Inlet. 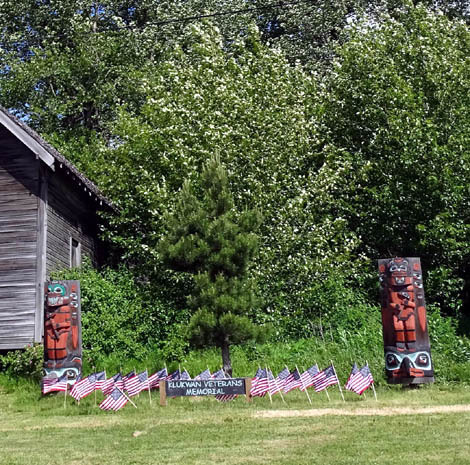 We passed Klukwan, the only remaining Native Indian village in the area, and drove about ten miles through the Alaska Chilkat Bald Eagle Preserve. 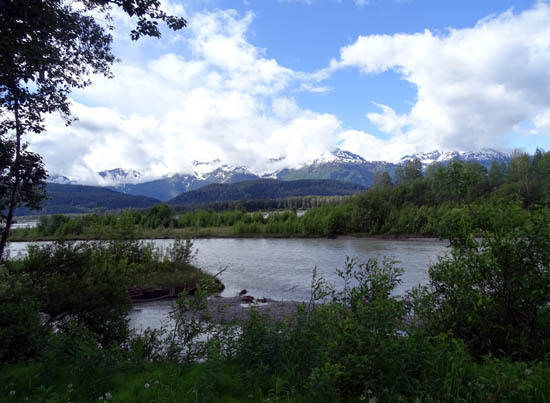 Two days later we took a day drive along the river for 21 miles upstream from town, stopping at several of the overlooks and the Council Grounds in search of mountain scenery and bald eagles. 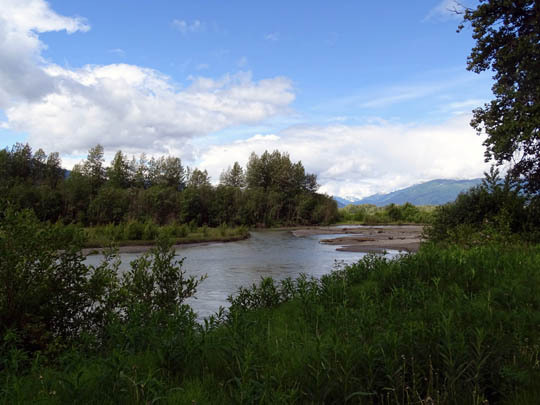 The most developed wayside along the Chilkat River is the site of the Council Grounds, where up to 4,000 bald eagles congregate each November in search of spawning salmon. 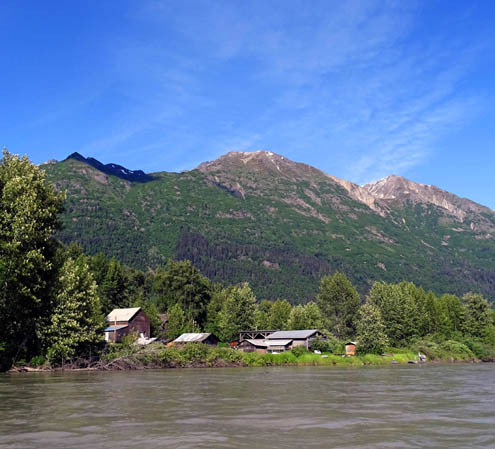 The river never freezes in this section of the river so the salmon continue swimming upstream later in the fall than in other places in Alaska. Bears and eagles have a feast! 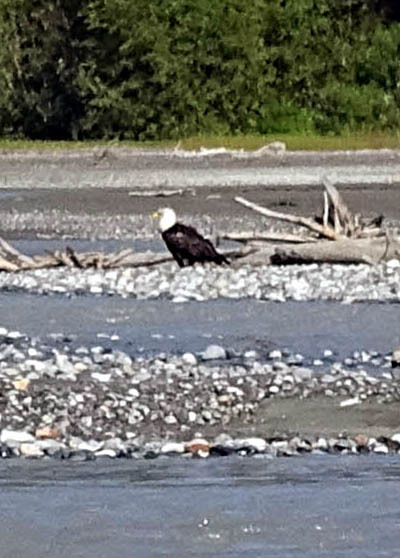 Although we didn't see any bald eagles that day, we did see some closer to town and on bike rides and hikes during our stay. We are here too early for the large gathering of the eagles in late October and early November when the salmon are running strong in this part of the river, which never freezes. 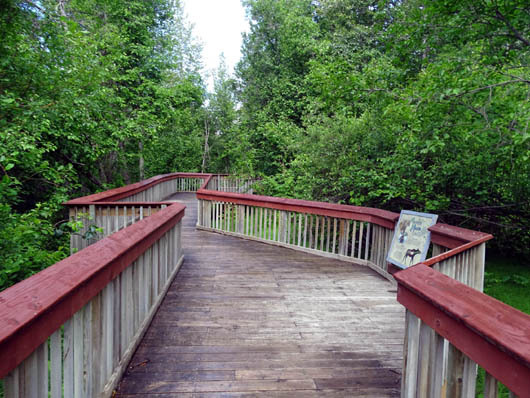 About a mile north of the Council Grounds the Native Village of Klukwan lies between the Haines Hwy. 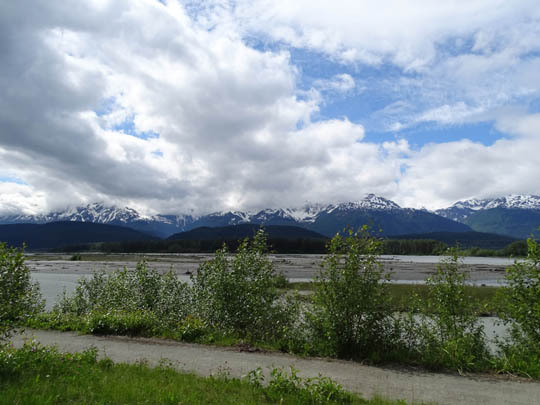 and the Chilkat River. 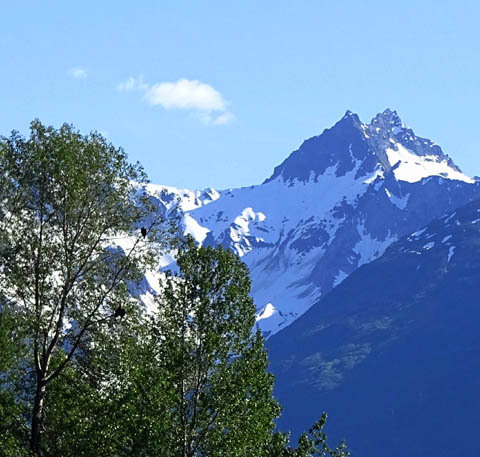 It was the largest of the Tlingit Chilkat communities in the northern Panhandle of Alaska (with about 600 people in 1880) and is the only one that remains today. The village operates under a tribal government today. 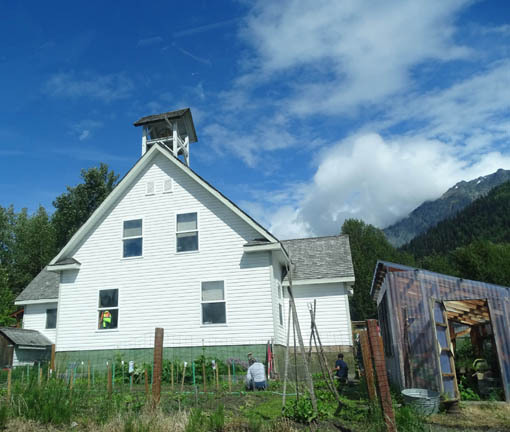 Village members and elders are working hard to revive and preserve traditional Tlingit art and skills during cultural workshops that are held each summer. 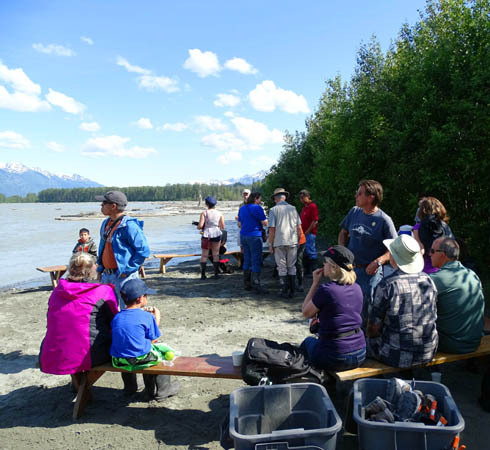 The village also offers tours that feature artists in residence, storytelling, traditional fish processing demonstrations, and local cuisine. Although we didn't participate in any of those activities we did drive through the small village and I could see some of the buildings from the river when I did my float trip. 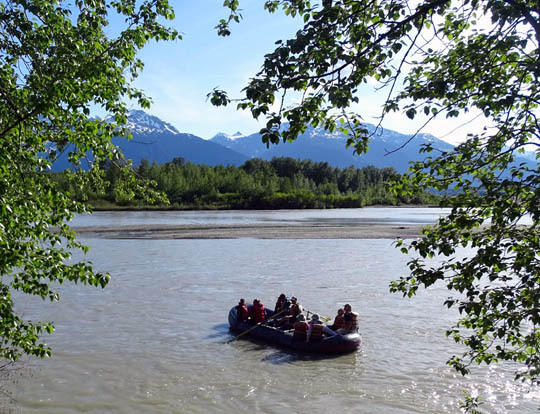 Surrounded by mountains, glaciers, wildflowers, and lush green trees on both sides of the road through the scenic Chilkat Valley during two trips on the Haines Hwy., I hatched the idea of joining a quiet float trip down the river during our stay. 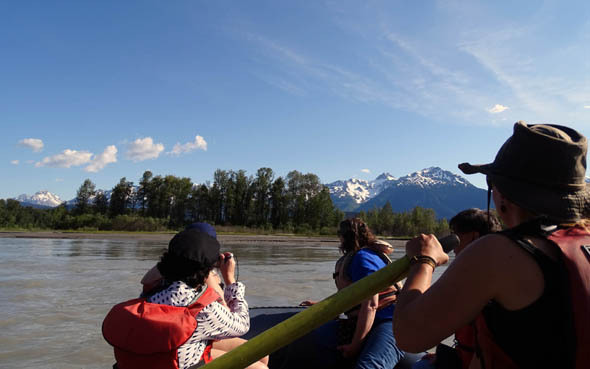 Local guide companies offer raft tours through the heart of the Bald Eagle Preserve, where moose, bears, coyotes, wolves, small mammals, birds like trumpeter swans and, yes, eagles, might be spotted any time of the year. 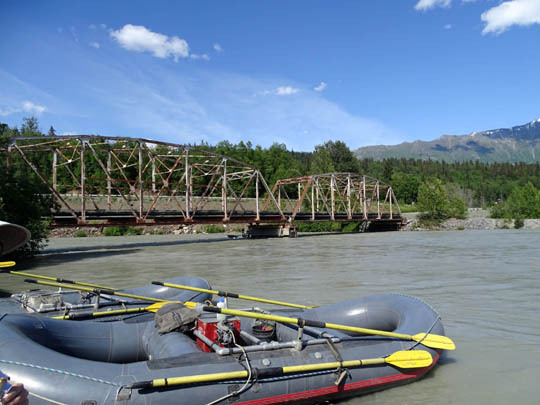 Jim prefers waiting until he can do a more exciting white-water raft trip somewhere else in Alaska this summer so he did a 40-mile bike ride while I went rafting this afternoon. 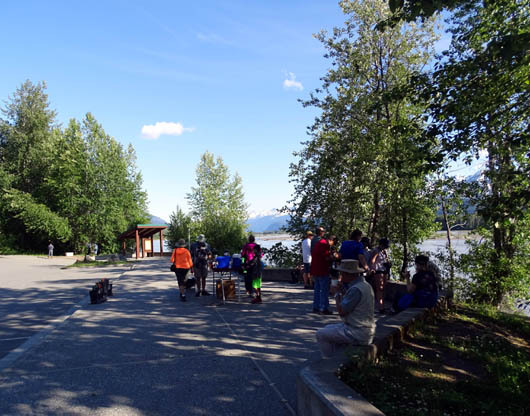 I chose Chilkat Guides, Inc. after getting recommendations from another RVer and our campground host. 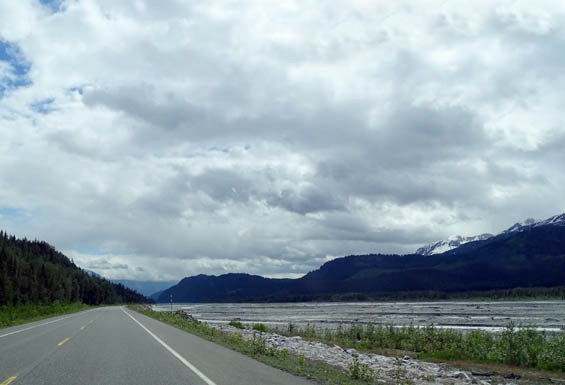 The four-hour trip, including lunch, snacks, and the bus ride from Haines to the put-in point and back to Haines from the take-out spot downstream, cost $89. I had a lot of fun and feel like I got my money's worth. Doesn't that look like fun?? Today's weather was the best we've had since we arrived five days ago -- sunny, 60-80 F., minimal breeze, low humidity. Days like this make us realize why people want to live and visit here (not so much the rainy ones). Jim and I both spent as much time outside as possible today. A van with Chilkat Guides picked me up at the campground about 3 PM and took me downtown to a comfortable bus with 20 people from various cruise ships that docked in nearby Skagway. This float trip was part of a day trip for them. We were entertained on the bus by a local fella who works for the guide company. 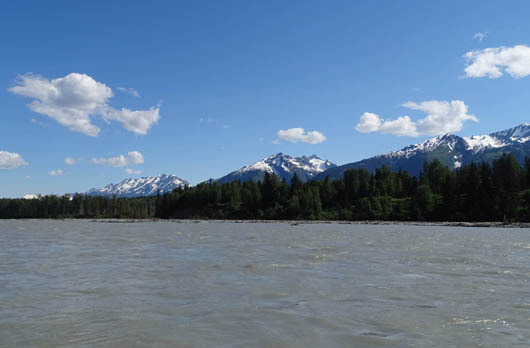 He and two young women guided the three rafts we rode down the Klehini and Chilkat rivers. Before getting on board we were served a picnic lunch (sandwiches, fruit, beverages), then issued boots, life jackets, and instructions re: what to do on the rafts if we got hung up in shallow places, etc. 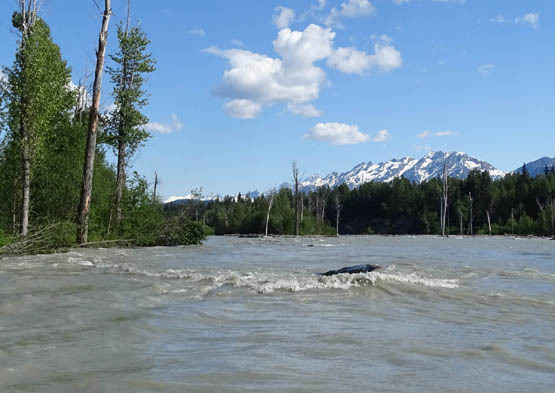 It was emphasized that the water in the rivers is only 35 F., despite the warm air temperatures, so we did our best to stay completely inside the rafts. I was in the first of three rafts with Jessica, a strong and competent guide. The rafts can hold up to eight people and the guide, who does all the rowing. I was in a group of six other people from two families from TX. 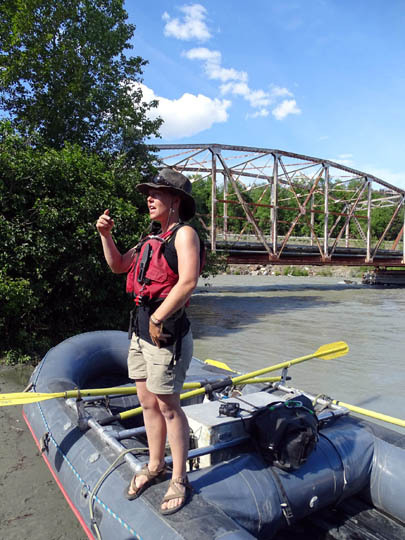 Our guide, Jessica, was very knowledgeable about the river and wildlife. She's guided up here since 2008, after graduating from a college in AZ with a degree in zoology. 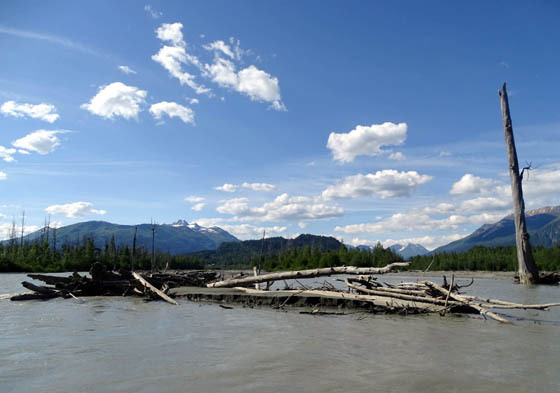 She has also guided on the Snake River in ID, which is trickier because it has a lot of whitewater. 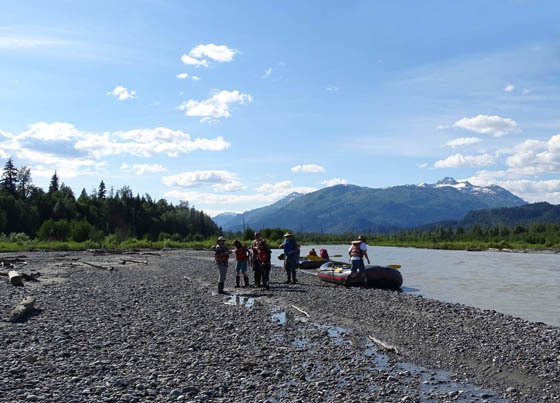 We were on it for about four miles, then just a couple miles on the Chilkat River, which was wider and slower. 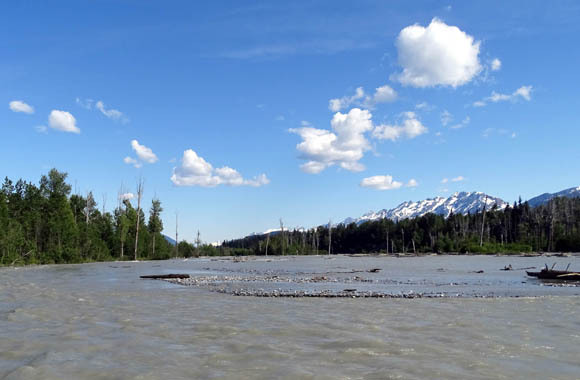 There are lots of braided channels in both rivers, as well as tree debris, and we wound around quite a bit to get the best lines through the water. The raft also turned periodically, sometimes going "backwards," sometimes sideways. We saw quite a few bald eagles in trees and a few on the ground but I didn't get any good shots of them. The raft was moving too fast for me to focus properly with the zoom. The two black spots in the tree are bald eagles; they aren't clear even if I zoom in farther. 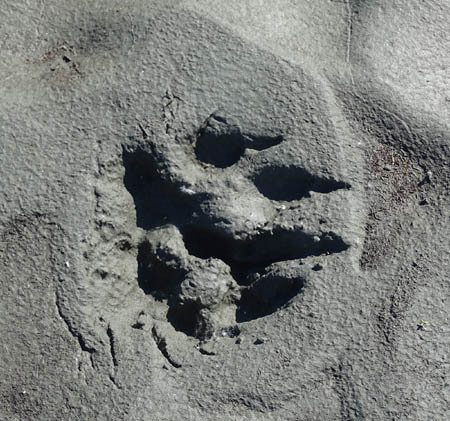 Unfortunately, we didn't see any large mammals like moose, bears, or wolves. 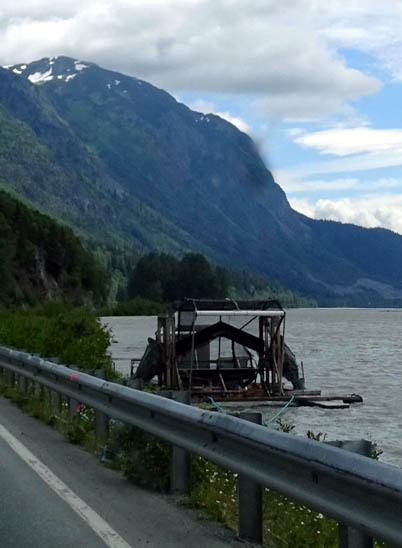 We did see some great scenery, though, and the river side of the tribal fishing village of Klukwan. I was able to get lots of scenic pictures of the rivers and mountains despite the bouncing raft. 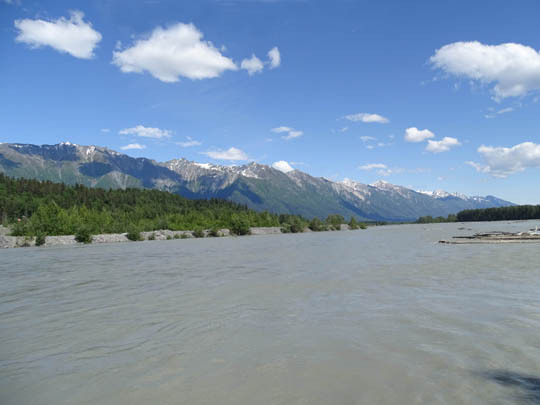 After the Klehini River merged with the Chilkat, the water spread out wider and the flow was a little slower. The raft trip was over too quickly! 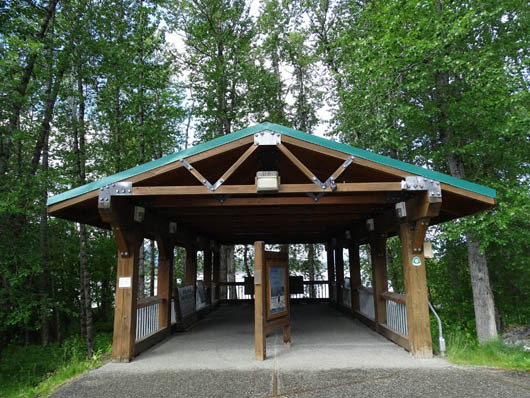 When we got out our shoes were arranged neatly on the benches at a rest area along the Haines Hwy. at about MP 20. 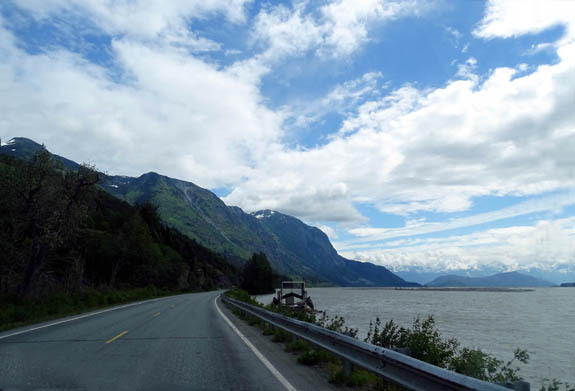 We were served cookies and beverages, then driven back to Haines. I can recommend this raft company and the float experience itself. 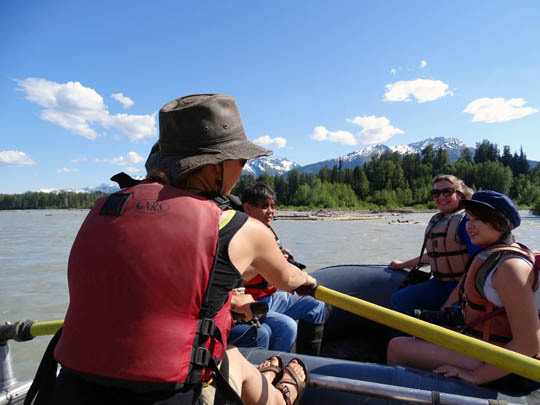 Even though I didn't see a lot of wildlife I did enjoy the spectacular scenery, the staff members, and the other guests who were along for the ride. Everyone was friendly and in a good mood. And did I mention that the weather was perfect today?? 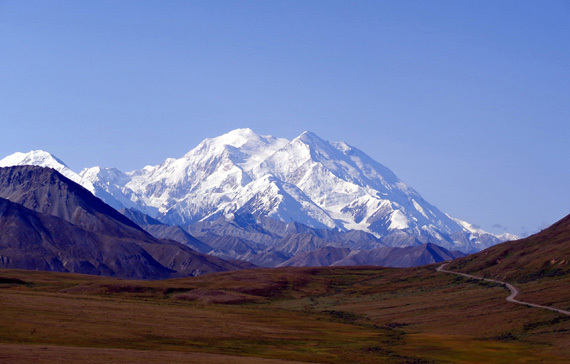 Next entry: scenes from a terrific hike to the summit of Mt. 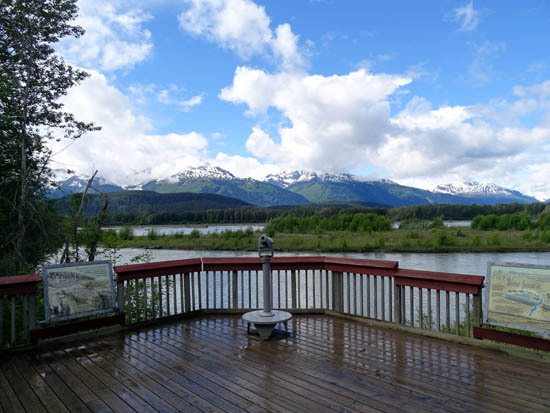 Ripinsky, with panoramic views of the entire peninsula, inlets, and surrounding mountain ranges.